Photo Panel Printed Bed sets. 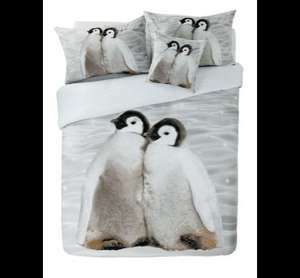 Set includes 1 duvet + 2 pillow cases. Some similar penguin ones on ebay around this price mark also if it helps you. thanks. There is plenty of stock of King Size for a couple of quid more. There are plenty of king size. Thanks and ordered. Lovely bedding,king size oos everywhere near me. Thankyou for that info,will have a look.